I'm super duper excited! The new Stampin' Up! Annual Catalog will be live in just three short weeks! That's right! Starting June 1, you can start ordering from the new catalog! Want to receive a FREE copy of this AWESOME new catalog that is jam-packed with AMAZING new product? Simply place an order with me during the month of May and I will send one right to your mailbox. Get your wish list ready. 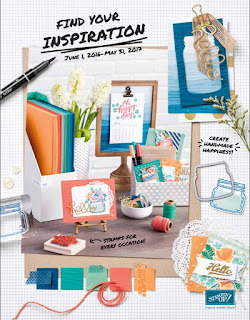 Check out today's video for a sneak peek of some of the product from the new catalog that will be sure to inspire you to transform paper into little works of art. Great video! Can't wait to see what you create with all of it! !